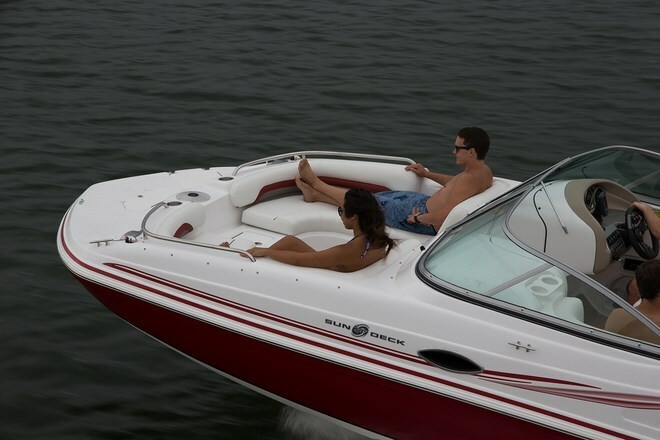 If you’re in the market for a deck boat, Hurricane Boats, part of the Nautic Global Group family out of Elkhart, Indiana, only makes deck boats and for 2015, offers a full range of thirty-six models of outboard and sterndrive powered deck boats in three series – SunDeck, SunDeck Sport, and FunDeck. The SD 217 SunDeck OB (outboard) is part of the fourteen model SunDeck series ranging from almost nineteen to over twenty-six feet. 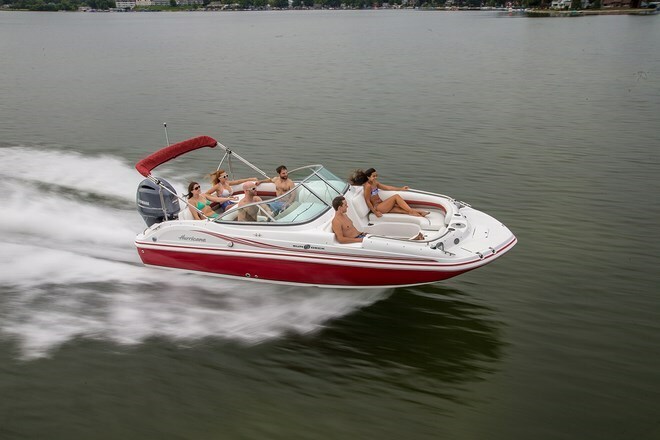 Almost all sizes in this SunDeck series are available in sterndrive as well as outboard powered variations, including the SD 217 SunDeck IO (sterndrive powered) sister to the SD 217 OB, subject of this review. In Hurricane’s own words, “The top-of-the-line Hurricane SunDeck Series sets the bar for all deck boats in design, performance, amenities and refined luxury.” And indeed, Hurricane packs a substantial list of standard equipment into its SunDeck models, plus it offers a wide selection of available accessory options to allow you to personalize one just right for your chosen on-water preferences. The beauty of this particular SD 217 OB (and its sister SD 217 IO) is that, even though they are part of the SunDeck series, these are two of nine SunDeck models referred to by Hurricane as “Value Boats” and come with the necessities you want and need in the standard boat and then may be optionally equipped virtually to your heart’s content. Being a deck boat with almost squared off bow seating area, this extra bow width allows for lots of legroom plus parallel full lounge seating with fully upholstered and padded backrests all-round. The forward faces of the two helm consoles are fully padded and slanted for comfortable full-out lounging. The entire bow area is virtually surrounded by a low safety grab rail, the exception being a unique indentation within the starboard side gunnel fibreglass mold designed as a step to assist in entering or exiting the bow area from the dock. A molded-in centre bow step with insulated cooler below provides easy access to the large flat forward bow platform with its dedicated anchor locker and standard starboard side telescoping bow boarding ladder. Within this bow area is an in-floor locker of suitable size to store all manner of watersports accessories, safety gear, etc. Cockpit passenger seating is provided by a huge L-shaped lounge seat which extends on the port side from the passenger helm right around the transom to the starboard side transom walk-thru leading to a molded half swim platform with a covered, recessed telescoping boarding ladder. There is also a half platform sans ladder on the port side of the outboard motor. The driver of the SD 217 OB enjoys the standard adjustable extra wide bucket seat with flip-up bolster. The driver’s attractively molded helm console comes standard with fog resistant gauges including speedometer, fuel, voltmeter, and tachometer. An hour meter is also standard as is Sea Star hydraulic steering with a tilt wheel. Outboard power of your choice to a maximum of 225 horsepower will provide plenty of get up and go. A Sony CDXM-20 player with MP3 input and two speakers is also standard. Within the passenger helm is a standard enclosed head compartment with sink and pressurized water. A porta-potti or electric toilet is optionally available. Immediately aft of the driver’s seat is a standard cockpit entertainment centre with sink and pressurized water. Other standard equipment includes a colour-coordinated canopy with protective boot. If cruising or entertaining is high on your priority list you may want to consider the optional bow filler cushion, bow and stern tables, a digital in-dash compass, digital in-dash depth finder, trim gauge, a selection of snap-in carpet, dual batteries, bow or stern fresh water washdown, LED docking lights, a transom stereo remote, two stereo upgrades, and Sirius satellite radio. For watersports enthusiasts, choose a ski tow bar or a wakeboard tower with bimini and with or without wakeboard racks. You may also want the LED underwater lights. If fishing is high on your list, Hurricane offers a wide range of accessories to enhance your fun and enjoyment from a livewell, to graph GPS/fish finders, rod storage clips, trolling motor harness, and even a regular or deluxe fishing seat. The available Fishing Package includes some of these items. A Preferred Option Group Package includes some handy cruising-type items and the Hardware Upgrade Package provides stainless steel trim upgrades. This SD 217 SunDeck OB and its sister SD 217 IO are indicative of the extent of experience and focus that Hurricane builds into its full line of deck boats.